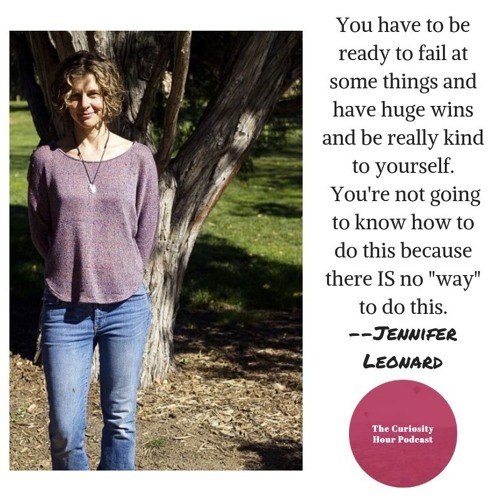 Episode 71 - Jennifer Leonard Dan Sterenchuk and Tommy Estlund are honored to have as our guest, Jennifer Leonard, LAc, MSMBM. While working as an emergency room technician in Philadelphia, Jennifer realized there was a fundamental problem with how patients were being treated. People would come in, get patched up, medicated, and be quickly sent home—only to come back again a few weeks or months later. The providers were treating the patient symptoms, but not the root causes of their health problems, so the treatments never stuck. She chose to study Traditional Chinese Medicine (TCM) because TCM practitioners are trained to discover and heal the underlying causes of disease. She obtained a master’s in TCM from Pacific College of Oriental Medicine in San Diego, California, which included an internship in Chengdu, China. She has been practicing acupuncture and TCM for a decade in a variety of environments, including creating an integrative medicine and acupuncture program at Good Samaritan Hospital in Denver, working at acupuncture clinics, and establishing her own private practice. Her current practice is one-on-one personal wellness consulting and she helps people design a roadmap to achieve their health goals over the course of a year. Jennifer also offers both business consulting and wellness support for Health Professionals. Too many of providers care for their clients at our own expense. Website: https://www.evolvepersonalwellness.com Note: Guests create their own bio description for each episode. The Curiosity Hour Podcast is hosted and produced by Dan Sterenchuk and Tommy Estlund. Please visit our website for more information: thecuriosityhourpodcast.com Please visit this page for information where you can listen to our podcast: thecuriosityhourpodcast.com/listen/ If you would like to share your story or have a suggested guest, please complete the "Contact us" form: thecuriosityhourpodcast.com/contact-us/ Disclaimers: The Curiosity Hour Podcast may contain content not suitable for all audiences. Listener discretion advised. The views and opinions expressed by the guests on this podcast are solely those of the guest(s). These views and opinions do not necessarily represent those of The Curiosity Hour Podcast. This podcast may contain explicit language.